A blog from the "random guy on the Internet" about photography as seen and done by a noob. While a camera is neither nearsighted nor farsighted, it will most surely need to wear glasses. Or more correctly said: lenses. Not the small contact lens we humans place on our eyes, though. These are the more heavier lenses. And without a lens your camera is not nearsighted or farsighted, but blind. So let's talk about the glasses your camera might need. First of all, this is about a camera with interchangeable lenses. If you have one of those nifty cell phones, or a small compact camera, I fear you're (almost) out of luck. 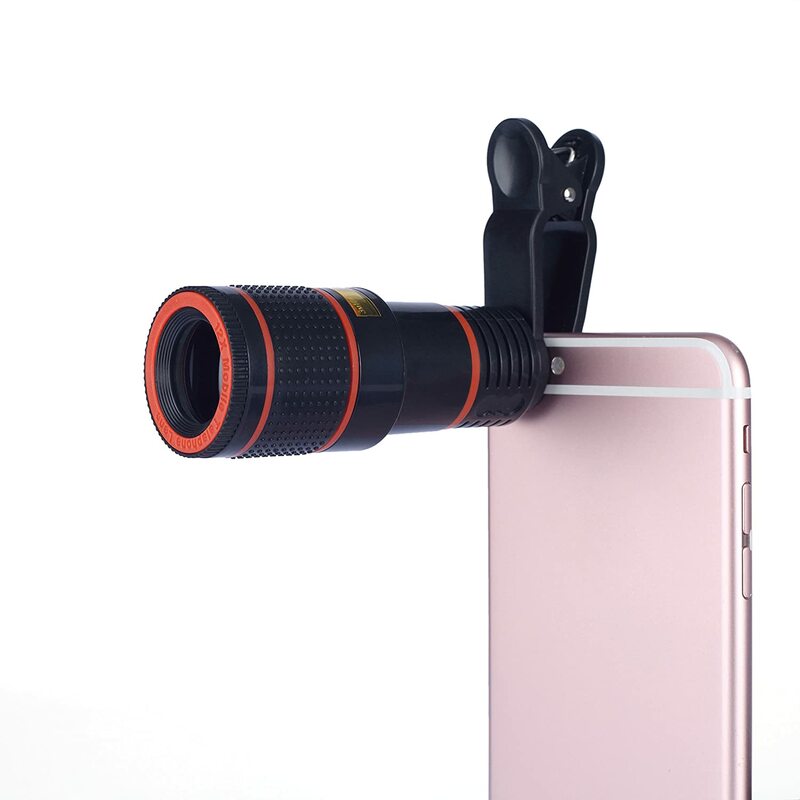 As you can see on the picture you could get lenses for your cell phone. In this case a cute, adorable, pink iPhone 6S. I can't really judge the quality, but given the price, the way it's attached - like some paper clip - I seriously doubt this will get you professional looking photos. Of course, if you happen to have one of these, and have great photos, please share them. One of my Google+ groups even has a special section for "Phone Photo Friday" and we can surely use more members there. We're also not going to talk about the two million dollar lens I mentioned in the previous post. I am aware that you will need that one soon, but just keep saving money for the coming weeks, or you won't be able to buy it. Many guys seem to believe this, many girls seem to say it's not true. They are usually talking about something else than a lens. I am a small guy, so I hope the girls are correct on that topic. On the topic of lenses, I can assure you: the girls are correct. Not saying the guys have it totally wrong, but before you think of size, you need to think of type of lens. And not just whether you want to be walking with a mobile heat seeking missile launcher, like the man on the picture, But more about what you want to shoot. Shoot photos, I mean, not shoot missiles. Obviously. If your answer is: I want to shoot it all, then I suggest you buy a lot of lenses. Because we have different types of lenses. Often this has to do with how far they zoom in, but there are pretty special ones, like the fisheye lens. And then there is the thing with stabilization or not. Let's start with that one, as it's at least reduced to just two options: your lens has it, or it does not. Doesn't come much easier than that, does it? If you're coming close to become an old man like me (well, perhaps not that old yet, but still), than you might notice it becomes harder to keep things in your hands without moving. Now, to take these awesome sharp photos, you do not want your hands to shake. You can help that a lot by using a good stance when using your camera. One of the reasons I like an optical viewfinder, as it's more stable. And people will tell you to keep your arms close to your body and so. Still, keeping perfectly still is hard to do. Luckily, we live in an age with lots of technology and here comes technology to the rescue. Just like your friendly local fire brigade. The lens makes a bit less noise than the fire brigade, and I admit is also much less important, but it still come to the rescue of the shaky hands. The lens with stabilization will correct for the small movements you make while holding your camera. So if you are like me: make sure to get that stabilization. Of course, different vendors will use different names for it, as vendors are not here to make life miserable for their competitors only. They also are here to make our lives miserable by making things harder. Oh, and they are also here to take our money. If you take a Nikon lens, it is called VR (Vibration Reduction) and they now even have VR II. Should you buy a Canon lens, it will be called IS (Image Stabilization). And our friends from Sigma call it OS (Optical Stabilization), while Tamron names it VC (Vibration Compensation) and Sony goes for SS (Steady Shot). In case you wonder: yes, they all do the same, they all come to the rescue of the shaky hands. Always buy that? Perhaps not. Lenses with stabilization are more expensive than lenses without. Also, if you mostly shoot with short lenses, during day time, you can have a quite high shutter speed, so might not need it anyway. In general, being more expensive seems to be the only drawback. Perhaps not bigger, but the longer, the better! Longer what? Oh, you mean the focal length of the lens. I see, yeah, well, still not always true. What is actually this thing focal length? From Wikipedia: "The focal length of an optical system is a measure of how strongly the system converges or diverges light. For an optical system in air, it is the distance over which initially collimated (parallel) rays are brought to a focus. A system with a shorter focal length has greater optical power than one with a long focal length; that is, it bends the rays more sharply, bringing them to a focus in a shorter distance." If you understood that: great. To me that is a bit of techno mumbo jumbo. I mean: collimated rays? Is this Star Trek? Talking about Star Trek, did I mention that I liked the first series more than the ones after that? Wait, what? You want me to skip on Star trek and go back to photography? Okay, okay. Focal length for noobs means magnification. The focal length is measured in millimeters and the higher number magnifies more than the lower number. So take your cell phone with a focal length of 2 mm and then take my Sigma lens with a focal length of 600 mm. So obviously, my lens magnifies 300 times more than yours. Clear? Nope, not clear. Magnification also has to do with the size of the sensor. The size of the sensor on a typical cell phone is smaller than the sensor on a DSLR. So, the same magnification on a cell phone needs less focal length than on a DSLR. Just as any lens on my D3200 with APS-C sensor magnifies 1.5 times as much as it would do on a 35mm full camera, as a 35mm sensor is 1.5 times larger than my APS-C sensor. Larger sensors get less magnification, but have more detail. Does it get confusing already? It might. But at that point it might also be an idea to just keep the simple thought: a longer focal length on a lens for your camera, means more magnification. So, if you look at our friendly pirate captain in the picture: he has a long focal length, so he will get a nice magnification. Whether he looks straight can be questioned, but whatever he sees, he sees it BIG! With the stuff above in mind, what focal length do you need to buy? That depends on what you want to have in your photos. If you stand next to your subject, you do not want the lens with the longest focal length. If you do landscapes, you do not need that either. If you want close-ups of wildlife, where it's hard to come close: you will probably like longer focal length. Just as with sports. There is no clear answer and you will simply have to try and decide. What would I buy with my current knowledge? I started with two lenses, an 18-55 mm and a 55-300 mm. They both came with the camera. Al the start, I found myself almost always taking photos with the 55-300 mm lens. Lately I noticed that I don't always need the close-up. I can walk closer, or I like more context around and I am regularly out with the 18-55 mm. So, I find having them both very fine and would find it hard to pick one of them. In case I had no lens and need to buy one at the moment: both Canon and Nikon have an 18-200 mm, Sigma has an 18-300 mm and Tamron a 16-300 mm lens. If I had to buy just one lens, I would look at such a beast as it allows you to do a lot. In case you start thinking of math, when you read the word prime: sorry, this has nothing to do with prime numbers. If you thought I, being Dutch and having poor English skills, wrote it wrong and meant primary: no, this is not your favorite lens that you call your primary one. Prime in this case is the "opposite" of a zoom lens. The difference? A zoom lens zooms and a prime lens does not. 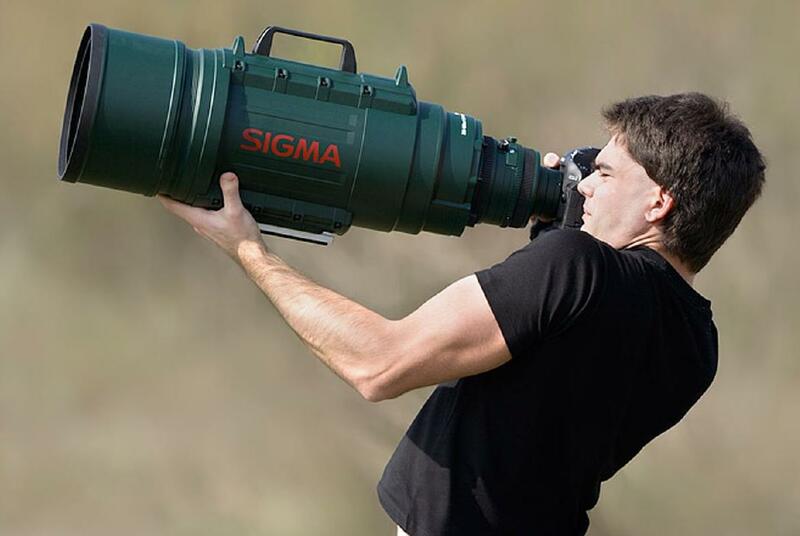 That's why one is called a zoom lens. So, now Captain Obvious has stated the obvious, let's elaborate. As said, a zoom lens zooms. So you get these ranges, like 18-55 mm. That's when you see those photographer turn a ring on their lens and it becomes longer. With guys you don't need to turn things, just turning them on makes their stuff go longer. They have zoom thingies. When they do that, they are zooming in (or out) and thus magnifying what they catch in the lens. A prime lens does not have that ability. If you see a photographer turn the ring on a lens and it is not going longer or shorter, then he is using manual focus, so yes. You can still turn things if you want, even on a prime lens. This may seem like a huge disadvantage, so why would you want a prime lens? The first answer might be: money. A prime lens is cheaper and weighs less. They also tend to give a better image quality. And, due to the more simple design often have a wider aperture than a zoom lens. Again, it's hard to say which one you need. Many guides say you learn better by using a prime lens and that might very well be true. However, I would say a beginner is better off with a zoom lens, as it offers more flexibility. No, not really. There is still more to tell about lenses. I mean, we did not even talk about macro lenses, right? And only mentioned the fisheye. But before you tire too much from all this reading, I'll stop bugging you for now.